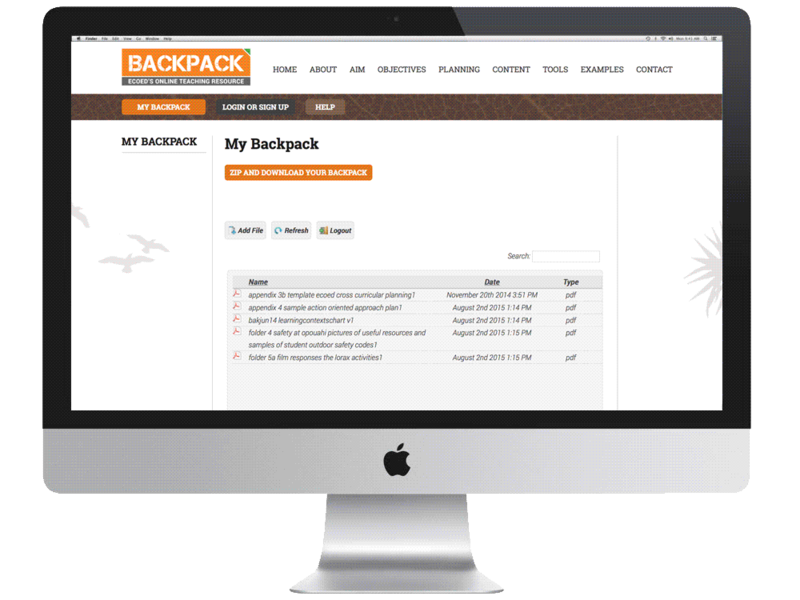 BackPack is an online teaching resource concept designed by ECOED and the Department of Conservation, and developed by Ed and Sitetools. In a nutshell, BackPack is an online information centre and digital repository where intermediate and secondary school teachers can discover EOTC content, plan their school’s camp, then download a virtual ‘backpack’ of resources for distribution amongst teaching staff and further use with students while on camp. The BackPack concept initially came to Ed as a hand-drawn, paste-up draft plan on an 8m long roll of 1.5m wide brown paper. On close examination it became clear this was a well thought through idea that clearly outlined a fresh, new approach to teacher planning in preparation for taking intermediate and secondary school students on EOTC camps. The draft explained the BackPack concept, before moving into its aim, objectives, planning methodology then content, tools and examples, all closely aligned with New Zealand’s national education curriculum. The brief to Ed was: “Please turn this into an online resource that’s accessible, easy-to-use and enhances EOTC experiences.” No worries said Ed. The first step was to determine how to metamorphosize the draft into the online digital environment. The core objective being to design a ‘path’ for future visitors to follow from landing on the site through discovery and assembly of their BackPacks, downloading them for distribution and use with other teachers, and of course the students. Therefore, Ed’s initial task was to translate the BackPack draft into a website sitemap. This involved organising and categorising the supplied content so it would be cohesive and consistent with the concept’s core goals and objectives. Essentially BackPack works like this. Upon landing on the site the visitor gets introduced to the concept’s background, vision, approach and the people involved. They’re then led through three phases from discovery through to planning and then to going on camp. In the discovery stage, the visitor learns about the aim and objectives of BackPack, who’s behind the initiative, and how it integrates with New Zealand’s national education curriculum. 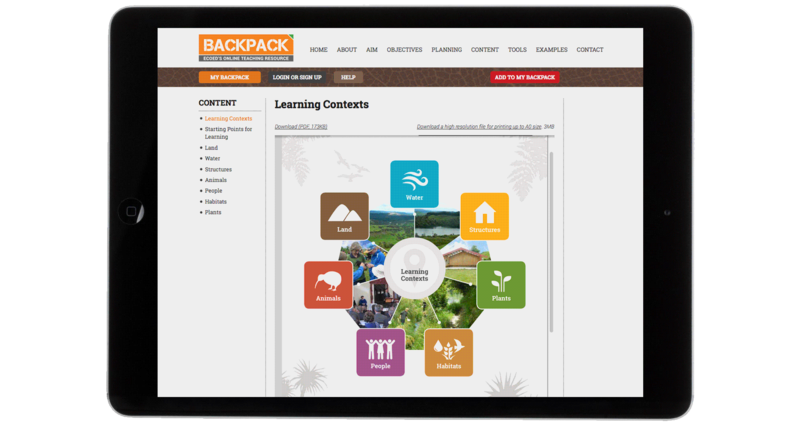 In the second stage, planning is addressed and this is where the visitor, after signing up, can begin to view and add resources from the website to their own BackPack. At any time they can view the contents of their BackPack and can even upload and add their own resources. The content available covers curriculum material, BackPack generated resources and examples and tools created by existing schools who have used BackPack. The final stage involves the visitor downloading their ‘BackPack’ of resources, which can then be distributed amongst the other teaching staff and those attending camp, including the students. These resources can be printed or viewed digitally while on camp with an iPad or other device. 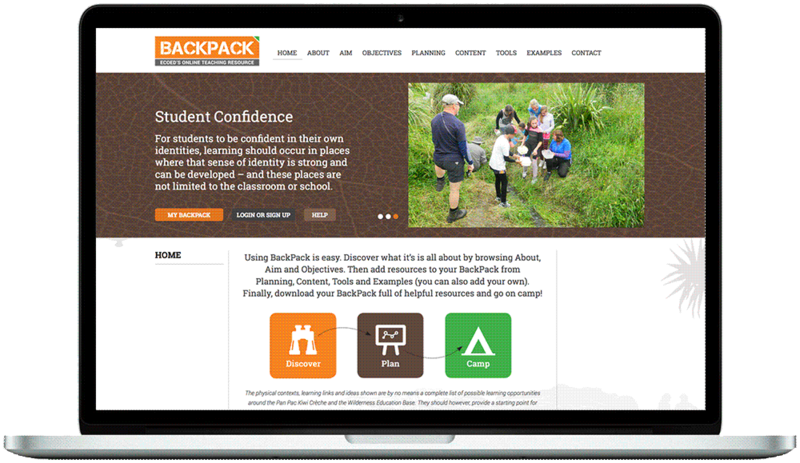 BackPack was launched in June 2015 in a presentation to ECOED’s board members and staff, the Department of Conservation, Hawke’s Bay Regional Council and local iwi Maungaharuru Tangitū Inc. BackPack is now being promoted to intermediate and secondary school teachers throughout Hawke’s Bay, as a free online resource to plan and go on camp. The goal is to run the BackPack project locally within Hawke’s Bay in conjunction with Northern Hawke’s Bay’s Pan Pac Kiwi Creche and Wilderness Education Base. And, if (when) successful, the intention is to roll out BackPack across New Zealand, and potentially … beyond.